Welcome to our multigenerational home! My husband is a medical resident and has loads of student debt, so we are blessed to be able to live with my dad in my childhood home right now to save money on rent so that we can make loan payments. My mom passed away 10 years ago, so my dad was a widower living all alone in a big ole house. We moved in and filled it up with noise, mess, and love! It’s not a permanent living situation, but it has been a blessing to all of us, and we are all very happy with the arrangement. Dad and I planned and oversaw a major kitchen reno last spring, and then I redecorated the entire main floor. It hadn’t been redecorated in 21 years. It was a whooooooole lot of peach and blue. Early nineties peach and blue, baby! I can’t wait to show you all of the before and afters in the next month!! 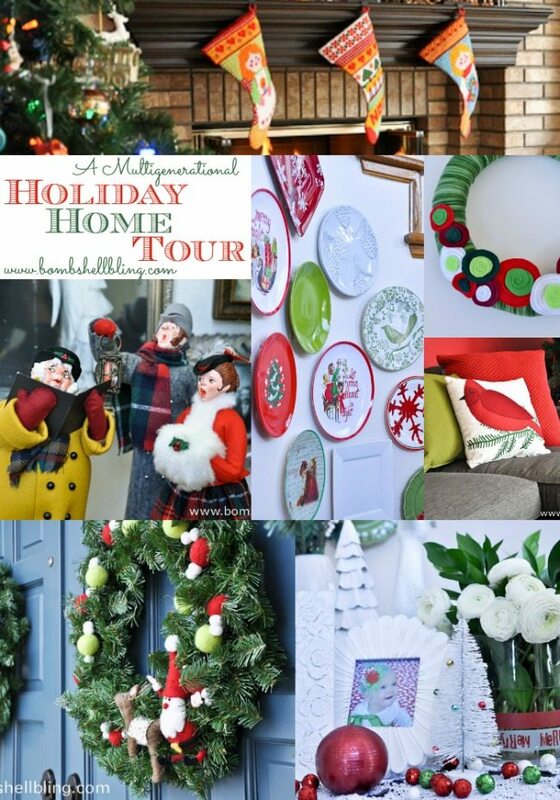 Today you will get a little sneak peek into a few rooms while I take you on a holiday home tour. 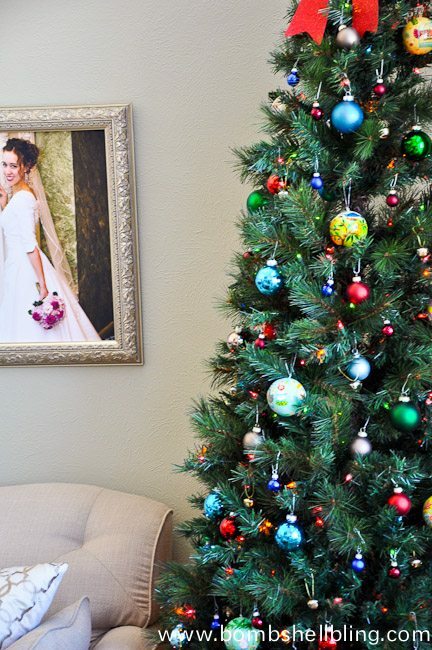 Let’s be honest: this holiday home tour will never be in a magazine. 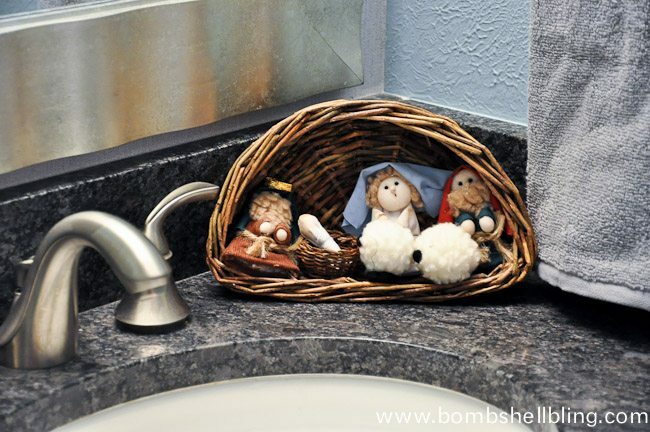 It will never be spotlighted on a home decor website or in a big blogger tour of homes. However, I love it. It is colorful, eclectic, and it represents three generations of feisty women. Some of the decorations are mine, some of them are my mom’s, and some of them are her mom’s, which she inherited at her mother’s passing. 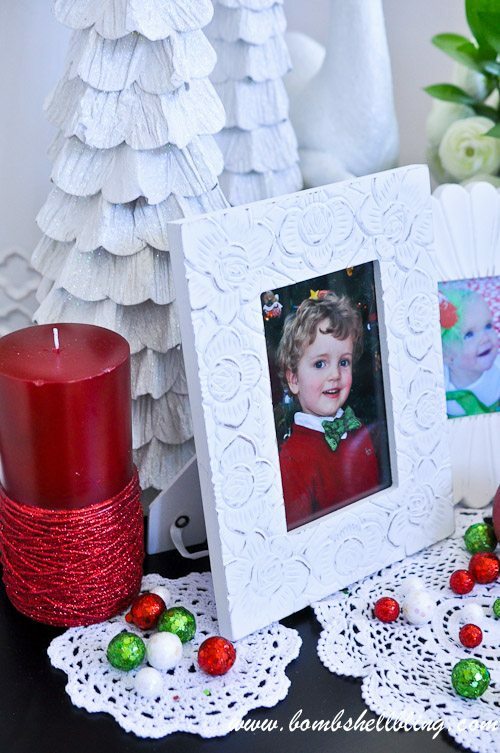 Since both of them are deceased and I am living in my mom’s home, I have all of these decorations at my disposal. This year I got rid of a few of her uglier items, but I kept or redid many of her handmade items. Let’s take a look. Welcome to our home! 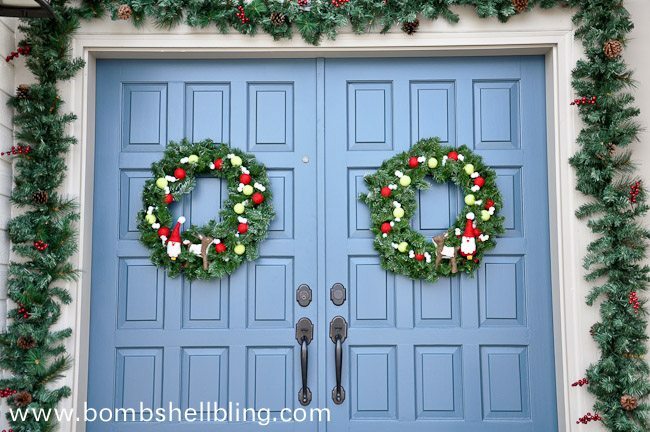 These cheery wreaths welcome you upon your arrival. 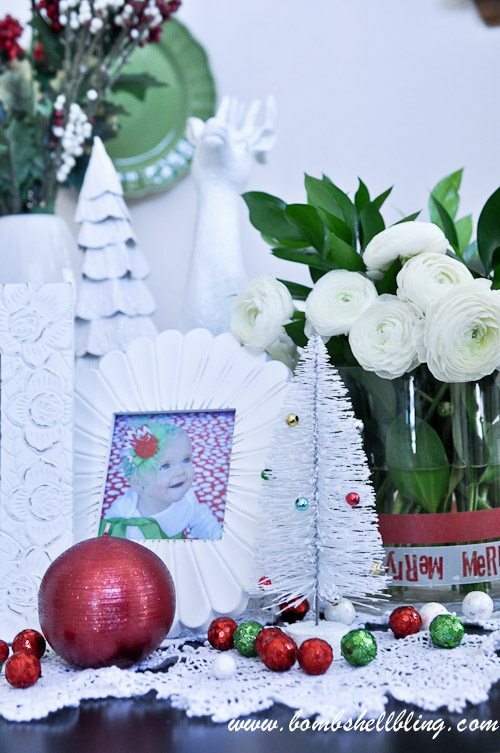 Check out how I put them together by giving my mom’s front door wreaths a makeover HERE. 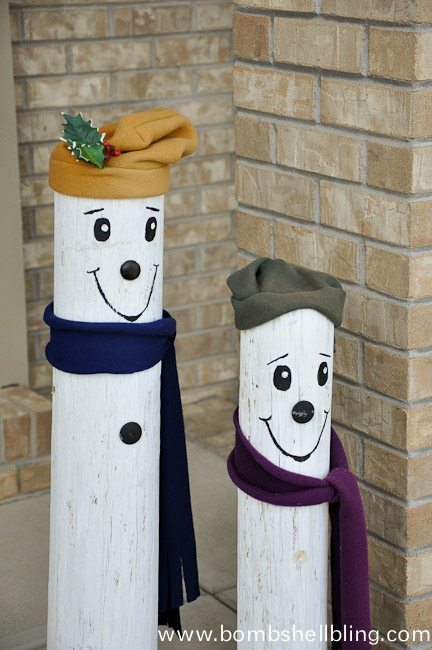 These happy snowmen that my mama made years ago are thrilled to have you visiting! Santa welcomes you just inside the door. He is a cheery piece of my mama as well, although I think she may have bought him. I’m not entirely sure. 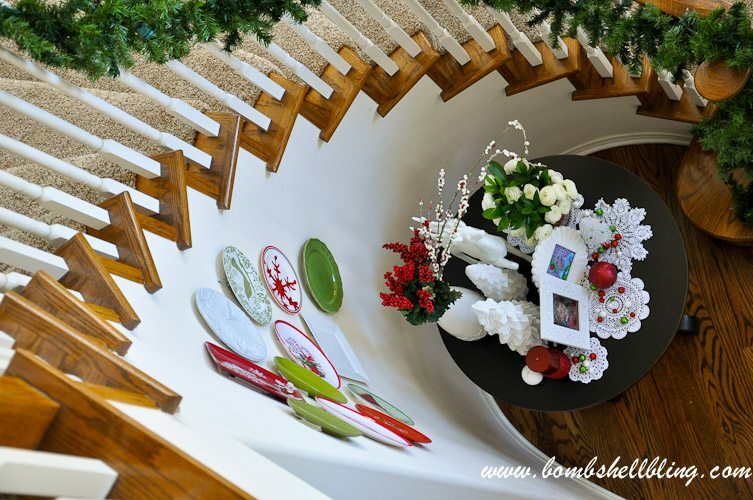 When you enter the first thing you see is the curving staircase, all draped with garlands. 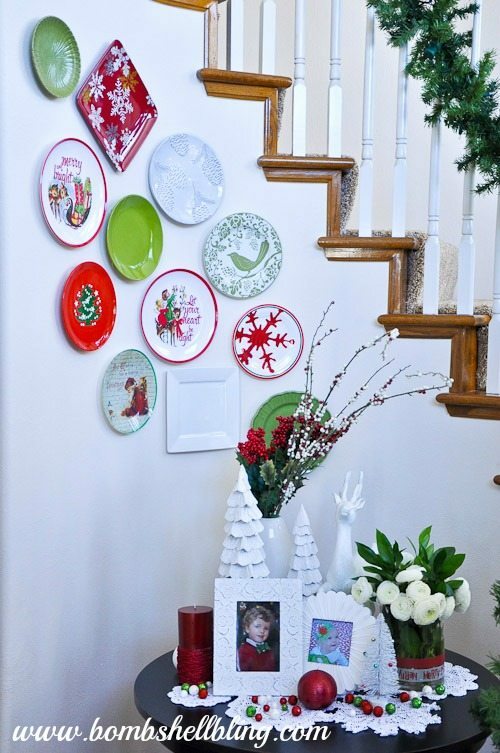 In the nook of the staircase is the Christmas Plate Wall and glittery table that I put together this year. 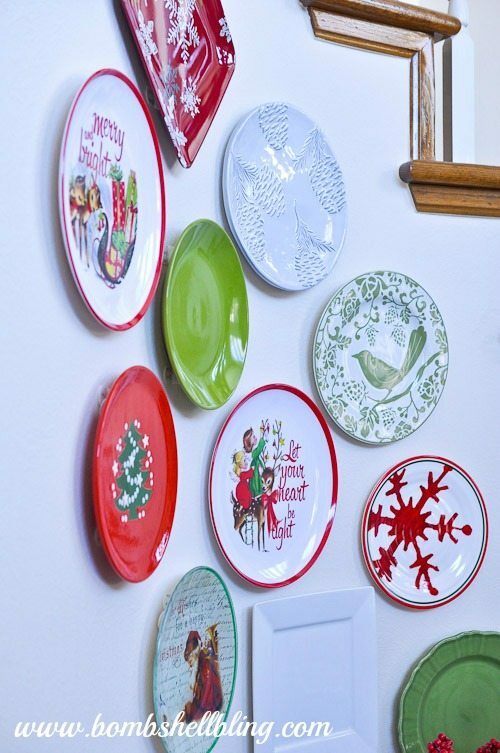 If you want to see more pictures of the table and wall, or if you want to find out where I bought all of the plates, see THIS post. I love all the bright colors and the glitter. Very me. 🙂 I also love the pics of my little cuties from years past. They are growing up way too quickly for my liking!! To the right of the stairs is our formal living room. 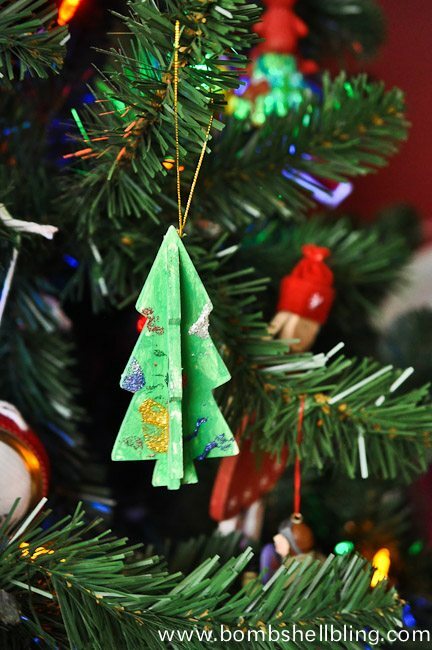 This is our “theme tree,” as my mom always called it. It used to be all peach and blue (shocker) with white lights, and it resided in the curved staircase nook where the plate wall now sits. Last year I decided to ditch the peach and blue and throw in some color, and this year I decided that it would look perfect in the corner of the living room, especially since it would show through the windows. 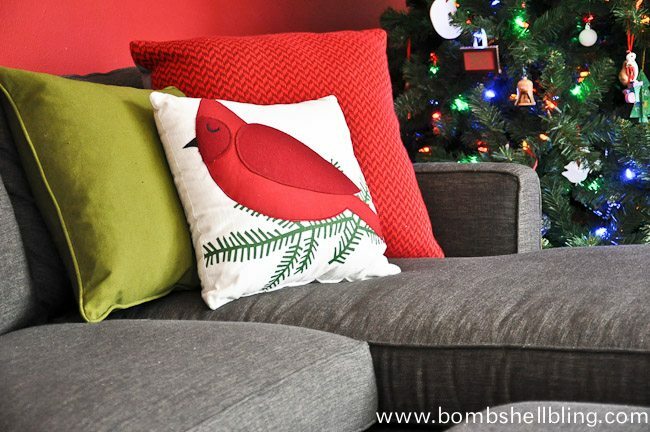 On the couches you will find a mixture of the pillows I bought this year and my mama’s festive Christmas pillows. 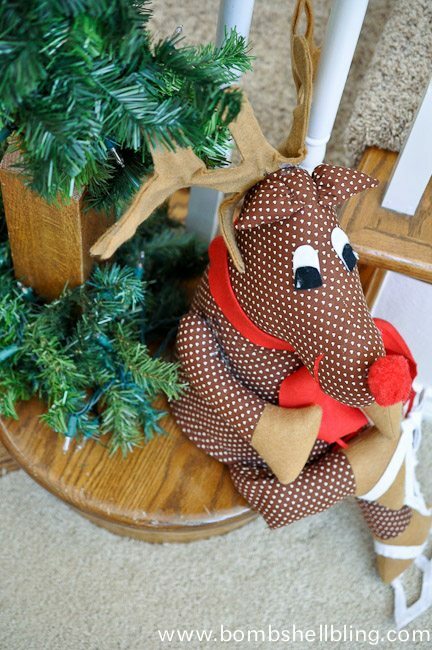 Watching from the corner is the darling Rudolph that my mom sewed many, many years ago. 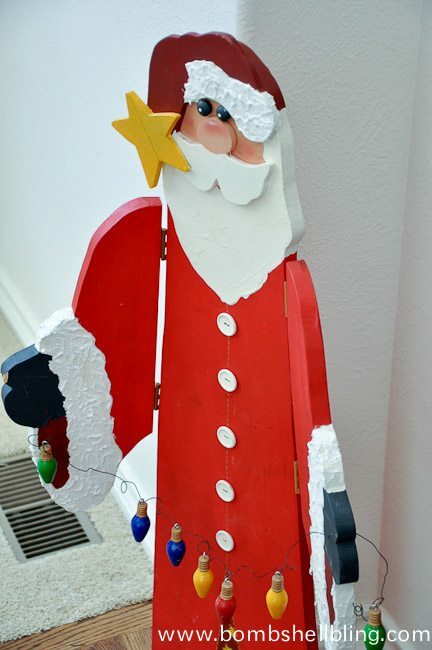 I adore it and it has held up over many decades of love from kiddos. 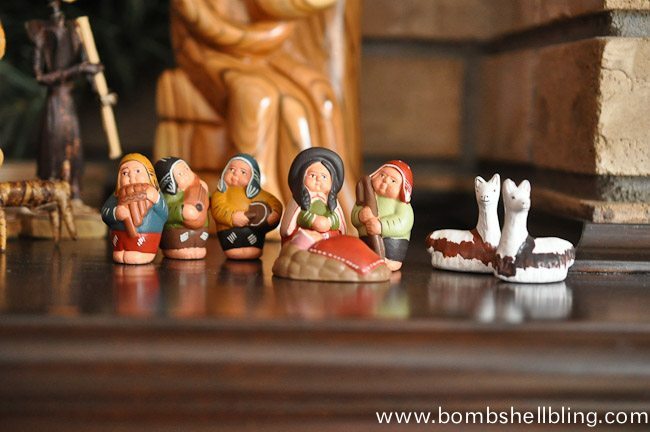 I love this sweet nativity that my dad brought to me after his trip with my sister Rachel to Israel. It is made with olive wood, and I love that it is sweet but still sturdy enough to withstand my destructive one year old. 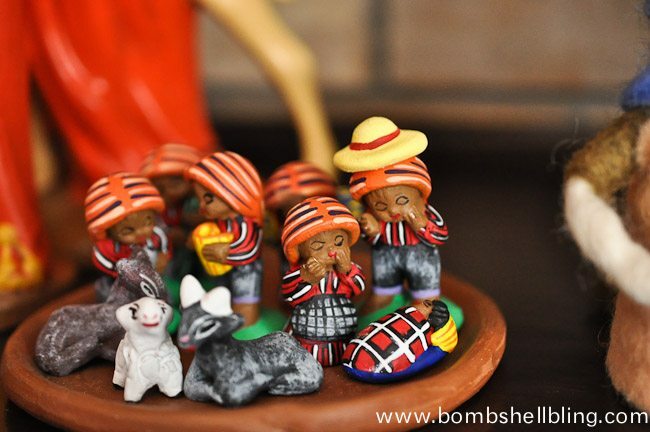 I have a collection of nativities from around the world (more on that in a minute! ), but I had to put all of them but this one in a very high spot this year to protect them. Through the formal living room is the formal dining room. 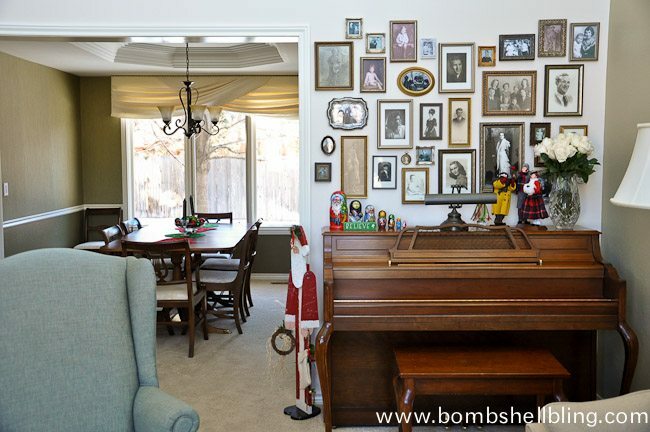 However, before we head to the dining room let’s talk about the area around the piano. This is a great sneak peek at my ancestor gallery wall. There are five generations of my ancestors represented in this gallery wall. I love genealogy and feel so close to all of them. It is my favorite part of the house now, and definitely my favorite thing that I did during the redecoration process. I can’t wait to tell you all about how I put it together and about the people in the pictures in January! 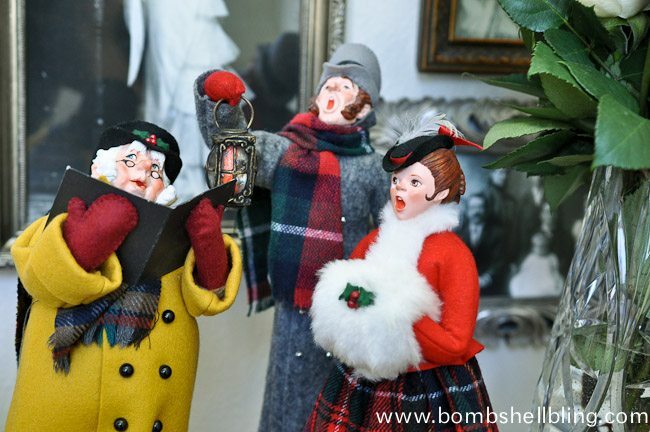 One of the things on the piano are my Grandma Barbara’s carolers. I love having them so close to the pictures of her and her ancestors. She and I are very much alike, and I miss her desperately. She passed away when I was only thirteen, but I have very vivid memories of her and the bond that we shared. She was amazing. 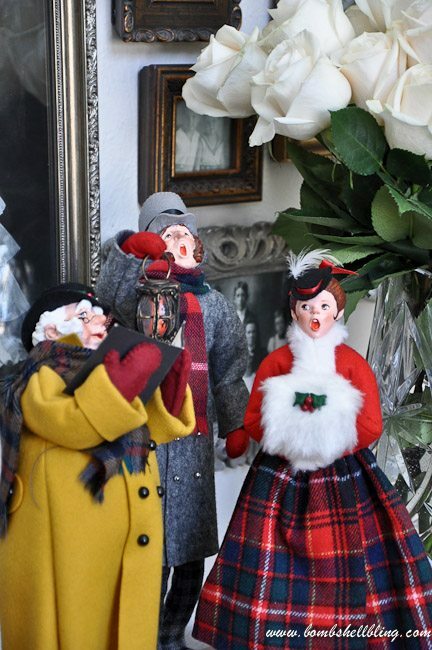 I have always loved Grandma’s carolers and thought that they were so cute, but I just discovered the other day–through a Pinterest comment of all things–that they are hand-carved Simpich dolls that are no longer in production and actually quite valuable! If you would like to know more about Simpich dolls then head HERE. 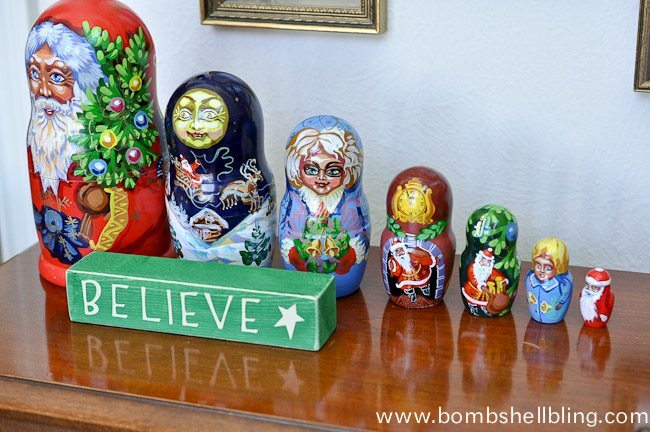 Also found on the piano are these rad matryoshka dolls that my parents bought in Russia. My father served a mission for our church, The Church of Jesus Christ of Latter-day Saints, in Norway long, long ago, and he took my mom on a Scandinavian Cruise for their 24th wedding anniversary so that he could go back and visit. (The weren’t sure her health would allow them to make it to their 25th. As it turns out, she passed away one month prior to their 26th anniversary.) They got these dolls on that cruise. The sign is a gift I got from a friend a few years back. The top shelf houses some candles and a musical snow globe that was given to my mom as a gift from one of her closest friends many Christmases ago. 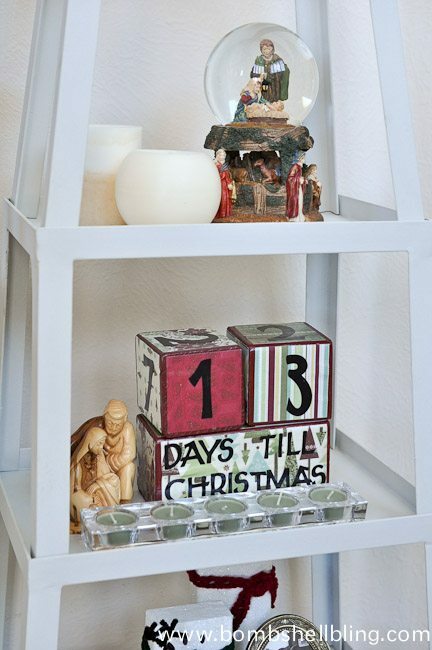 The second shelf is home to an olive wood nativity gifted to my mom from the same friend on a different Christmas, along with some tea light candles and a countdown I made at a church activity several years ago. Next up are more candles and some super classy angels made by my mom. (Or super outdated….whatever.) 😉 I love the raffia and the “hair.” SO nineties. They just make me happy! 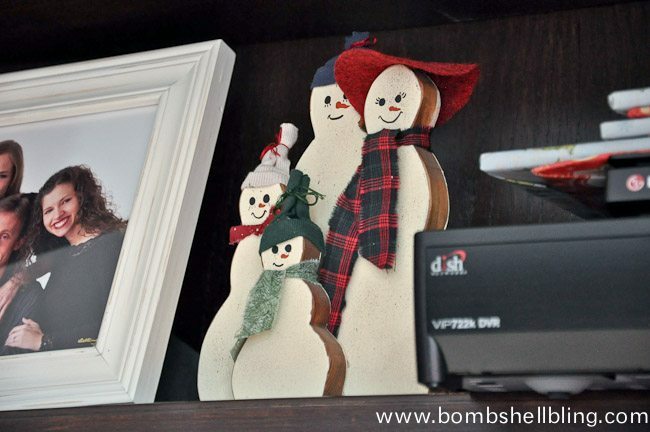 Finally we have two figures that my mom bought in London, a “melting” snowman that she made, and a framed subway art print found on the blog Eighteen 25 HERE. 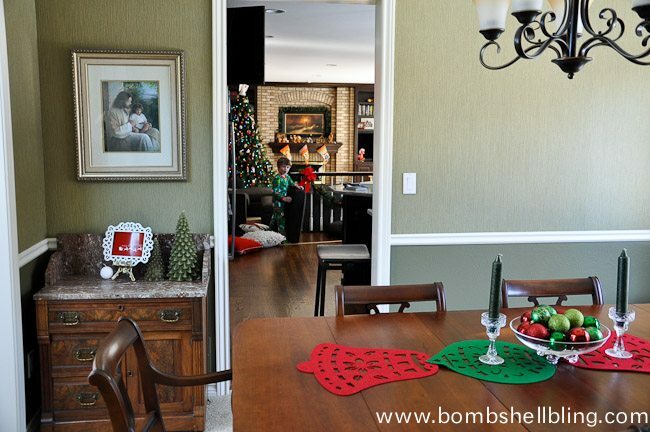 On to the formal dining room! On top of my great grandmother’s antique dining set you can see my Christmas Table Runner. It took me about 5 minutes to make and cost about 5 dollars. Truly. See the tutorial HERE. I finished it off with a glass bowl full of cheap red and green Christmas ornaments and some green candles in my mom’s crystal candle holders. Time to say farewell to “Bapa’s fancy rooms” and enter the kid zone of the house. As you can see, there is a little rascal in there already building things with the pillows that I just laid out carefully on the couch to photograph. Rascal! 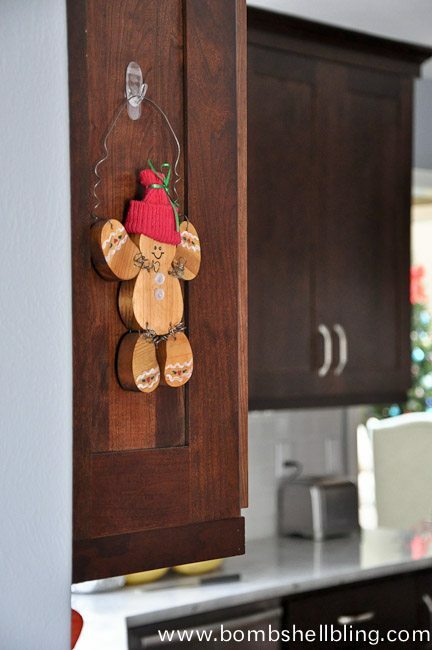 There will be no full kitchen reveal today—for that you will have to return!—but here are a few of the items that hang out around the kitchen. This little gingerbread man was my mom’s. It’s probably from a craft fair. She loved those. It was in the pre-Etsy days, you know. 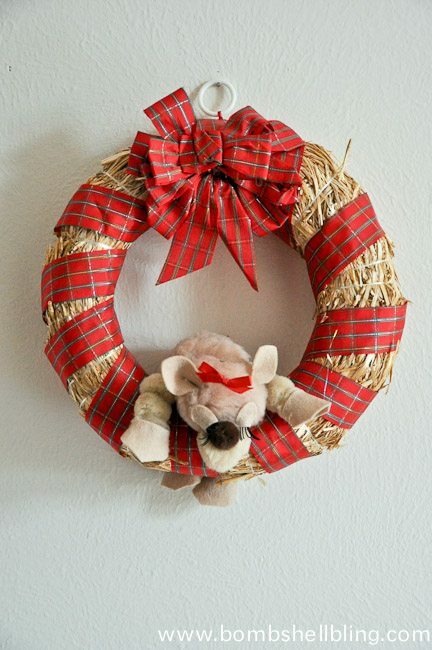 This sleepy little reindeer wreath was a Sally Westover creation as well. (My mom.) I think she made it with my Aunt Jackie and that they each have one, but I’m not positive. I will have to ask my aunt! 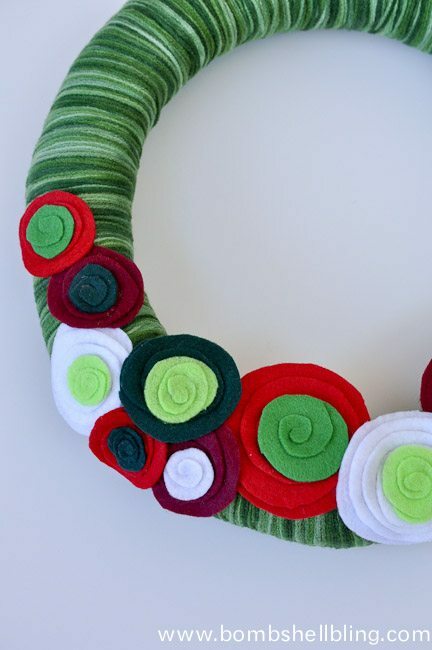 This yarn wreath was made last year by yours truly. For two years now I have been meaning to share a tutorial for it and I keep forgetting. Next year maybe…. In the newly gutted bathroom (reveal and before-after pics to come in January!) sits a cute little nativity that my Aunt Dana gave my mom one year for Christmas. My kids love it. Now on to my favorite room in the house. We spend the most time here by far. It is cozy, colorful, and full of so many happy memories. Our family room. I still can’t believe I talked my dad into that red wall, but I LOVE it! It looks even better in December than it does during the rest of the year! You are getting a major sneak peek of the furniture and gallery wall here, but I’m cool with that. Details to come later. This is a bit of a new look for our mantel. Usually it has a big wreath above it and lots of greenery and garlands. However, this year I decided that I couldn’t trust my daughter (whom my dad has dubbed “The Destructor”) around my nativity collection, so I chose to move it to the mantel rather than spreading it through the house like I usually do. The picture of Christ walking on the water is a new one that my dad found, and I couldn’t find the big wreath that my mom made for that spot, so we just wrapped some garland over the top of the picture and embraced The Reason for the Season being the centerpiece of our room. I actually really love having it take a religious twist this year. 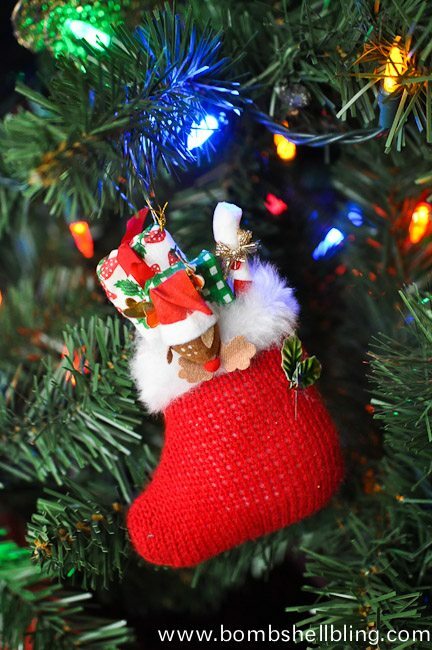 Before we look at my nativities up close, I would love to show you a couple more pictures of the stockings. My mom made these stockings for my sisters and I long ago when we were born. I love the classic, retro look of them and the fact that she made each stitch herself. Priceless. We have each left them with our dad for now so that he can have the full matching set to hang each year. 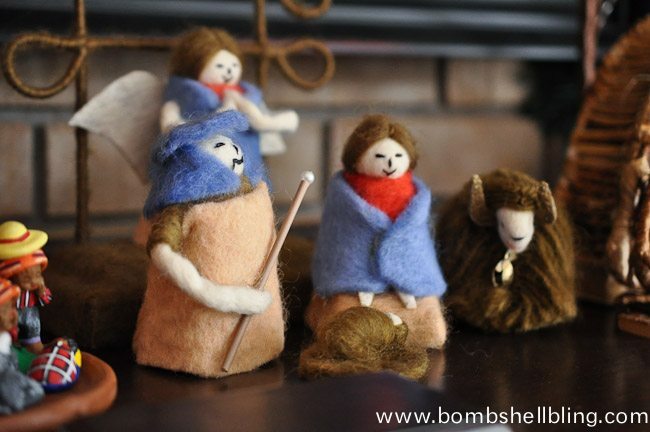 Now let’s talk nativities! I couldn’t get fab pictures of all of them because the sun was really bright this week bouncing off of the snow, but hopefully these pictures will do. 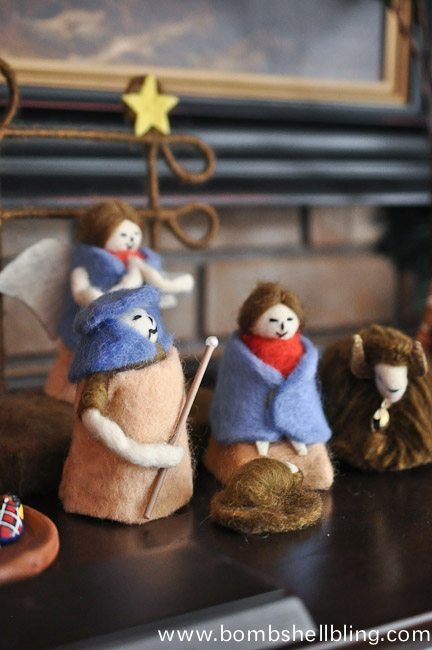 As I mentioned, I collect nativities from around the world. I look forward to having LOADS of these by the time that I die! Let’s take a closer look at each one. 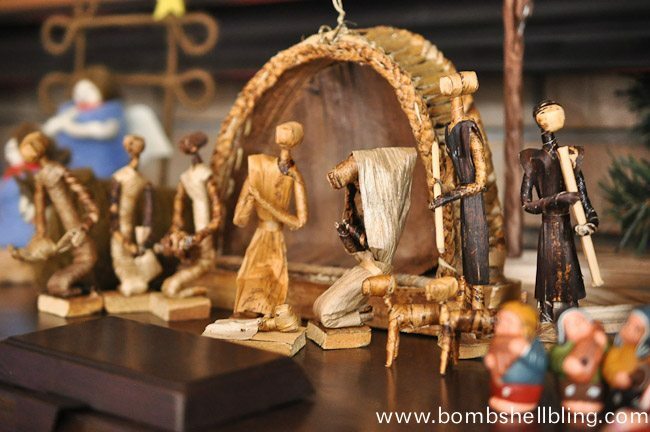 This nativity was made in Nepal. It was given to us as a wedding gift because we were married in December. 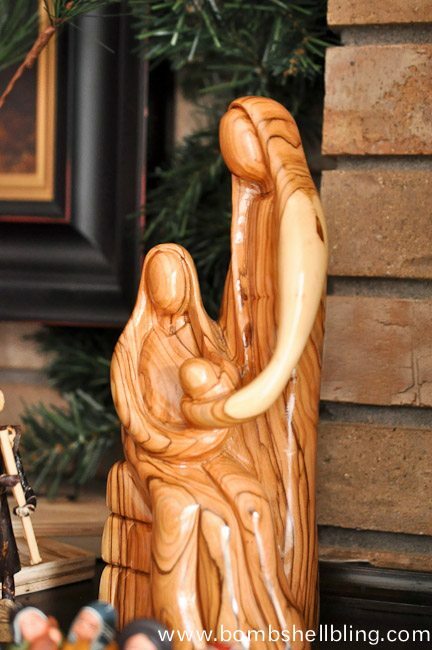 The next nativity is from Uganda. My sister Laura spent a summer there volunteering and brought this home with her for me. 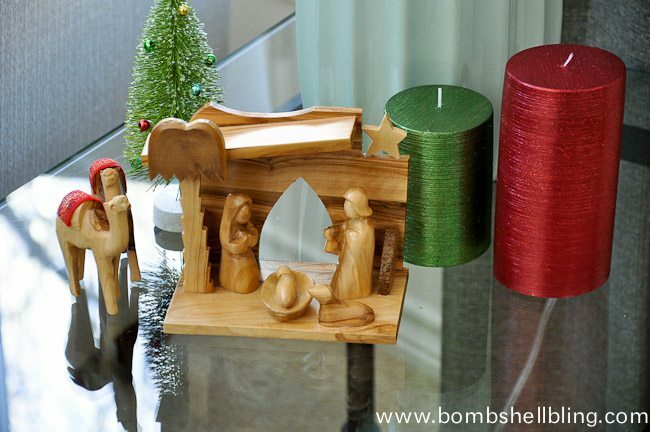 This stunning olive wood nativity is one that my dad bought for himself on his trip to Israel with my sister Rachel. In front of the Israel nativity is my nativity from Peru. The llamas fill me with joy. We have a weird llama obsession in my little family. Don’t ask. We’re nuts. My sister Laura brought this back for me after she took a group of teenagers (she’s a high school teacher) to Peru to hike Machu Picchu. This nativity was hand painted by my mom when they were poor newlyweds. I am amazed that it has lasted all of these years without breaking! This nativity is the main reason that I decided to put the nativities up high this year and out of reach of Lady Jade. 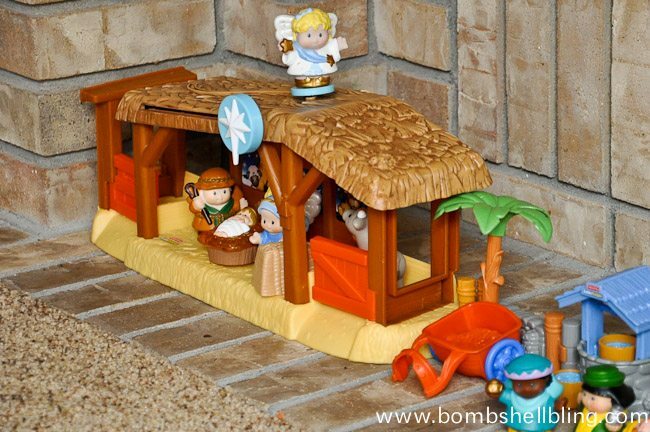 Of course, I needed a nativity for my kids to play with as well. Fisher Price pulls through! They love it! 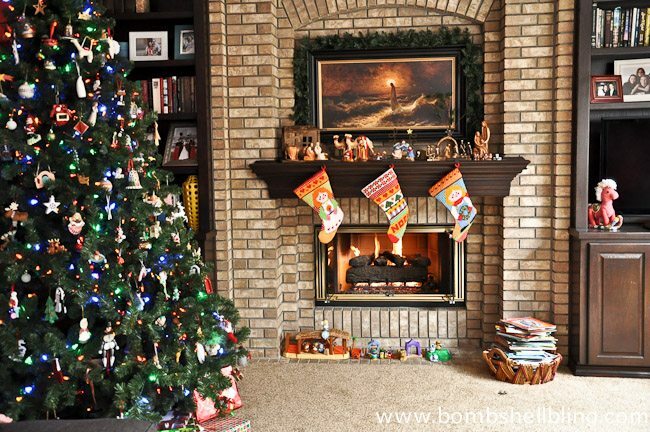 Now on to a few more details of the room before the grand finale: the tree! Sweet rocking horse sewn by my mom as a gift for a friend. That friend kindly sent it back to us as a gift the first Christmas after my mom passed away. 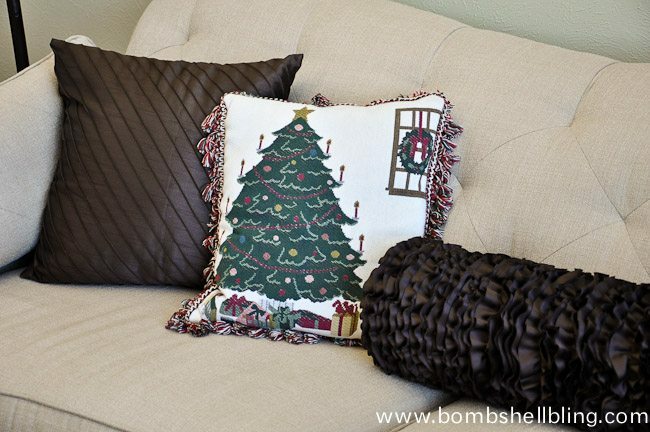 This year I hosted the Christmas party for the women at our church, and I had planned to sew super cute Grinch pillows prior to that party. Well, the day of the party rolled around and I threw my hands up and headed to Target to buy them instead. I must say, I’m glad I didn’t bother to sew any, because I love all of them! 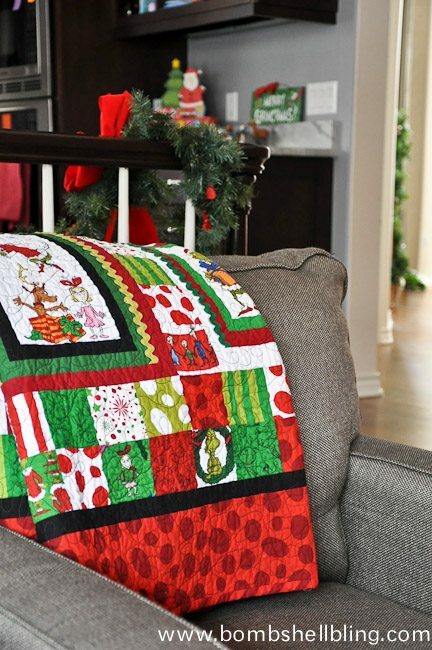 Check out this Grinch quilt that my mother-in-law made us a few years back. Isn’t it the most magnificent thing that you have ever seen?!?! On to the big finale: our tree!! It will never be featured and promoted by a big company or mistaken for a tree that could grace the pages of a Pottery Barn catalog, but I love it. It is colorful, it is random, and it is chock full of memories. 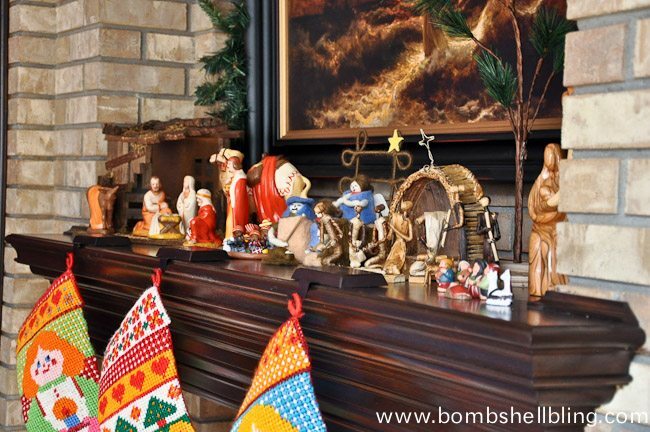 We have a tradition of ornament gift giving and collecting in our family. You can read all about it in THIS post. 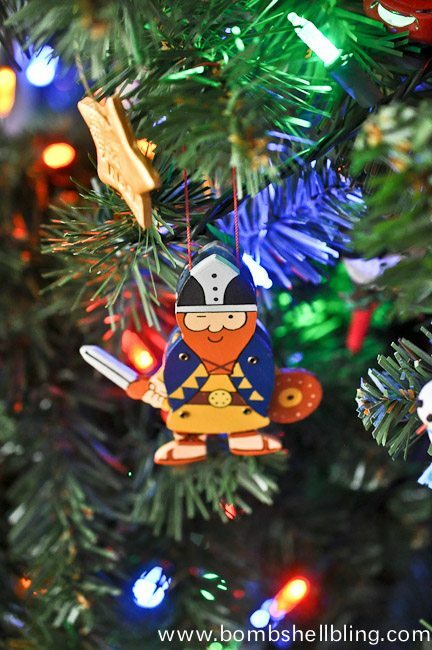 In short, my Grandma Barbara started giving us each an ornament for Christmas when we were born so that by the time we were married we would already have our own collection to fill a tree. My Grandma Elaine loved that idea and started doing the same. When my Grandma Barbara died my mom picked up the tradition, and when my mom died my DAD picked up the tradition! (That guy is the best!) 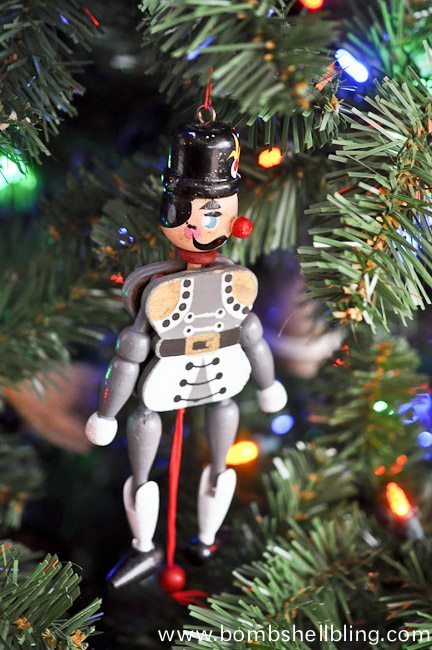 He still gets us—and our kids—ornaments every year for Christmas to represent our years. 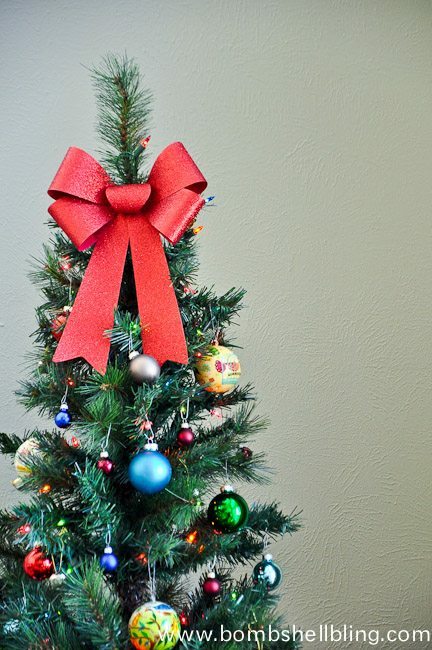 I have started getting my kids a special ornament each year as well. Additionally, my mom bought an ornament in every place that she has traveled, and I started doing the same in college. 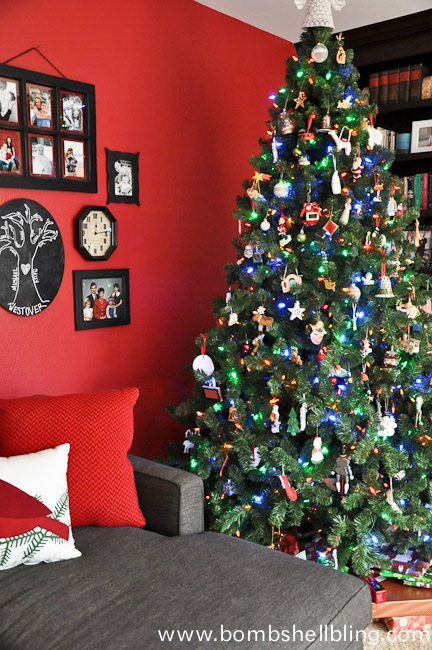 When I look at our tree I remember all of our trips, all of the special things that have happened in my life, and even the things that have happened in my kids’ lives. I think of my mom and my grandmas, and it just makes me happy. I am a sentimental fool, I will gladly admit it. 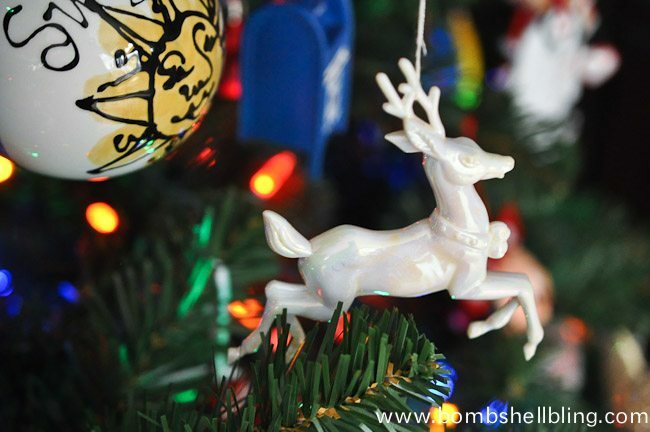 Please indulge me while I tell you about some of the ornaments on our tree, and then this insanely long holiday home tour will officially come to an end. 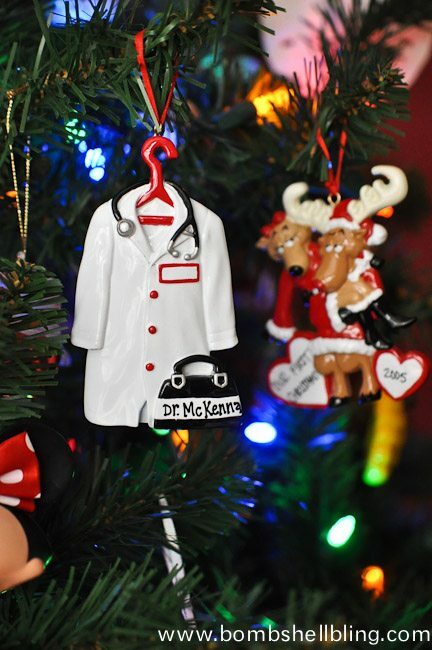 These are the first two ornaments that I ever received. 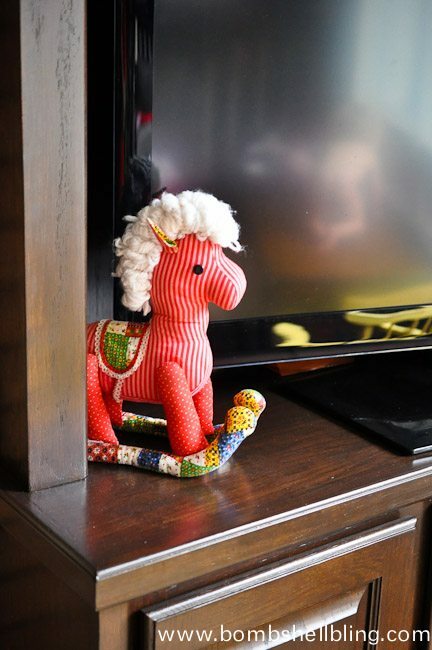 The year that I was born my Grandma Barbara gave me this stick horse and little doll ornament. Very retro. Very sweet. 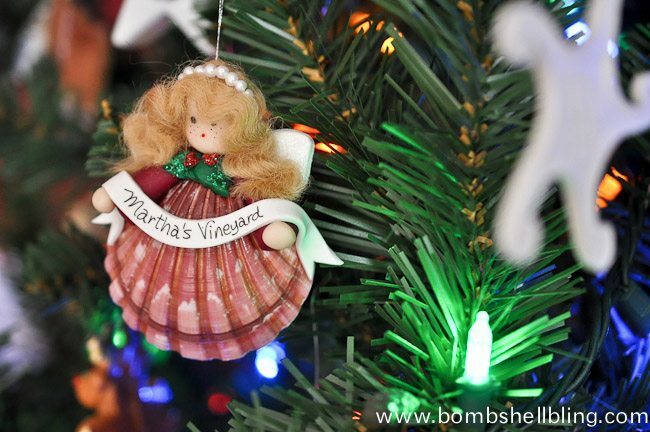 This is another one of my favorite ornaments from my Grandma Barbara. I have had it for as long as I can remember, so it must have come to me very early on in life. 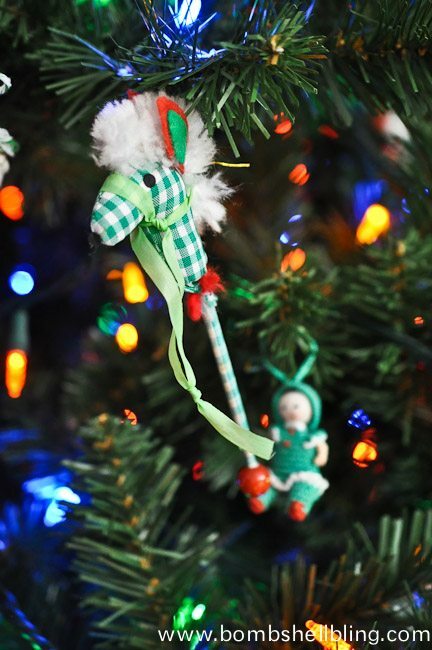 My Grandma Elaine always had a collection of ornaments and had us take turns choosing first each year. I still remember the year that I got the magic word to go first and chose this glass reindeer. I thought it was the most divine thing that I had ever seen in my entire life. My Grandma Barbara was a young widow, so she became a world traveler. She traveled all over the world with group tours, which is actually how she met her second husband, my Papa Scotty. 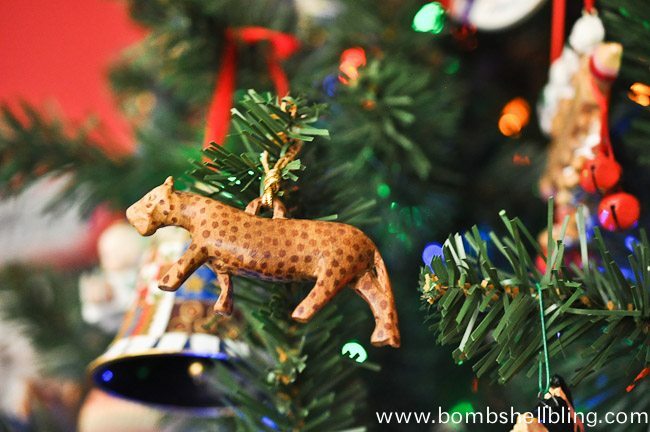 One year she went on a African Safari and brought us each back a wooden animal ornament. 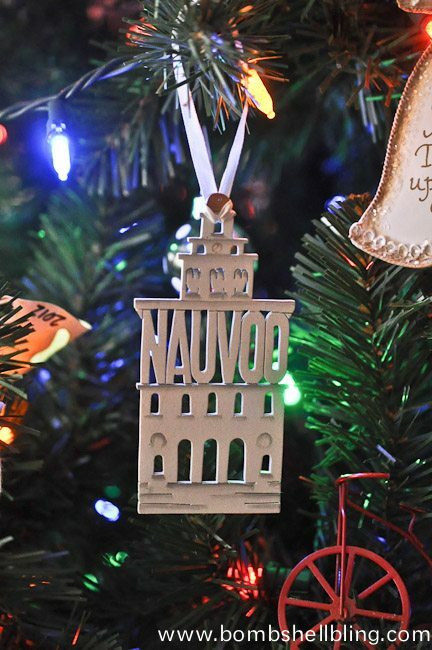 Another classic retro ornament from Grandma Barbara. I loved pulling the strings when I was little, and now my son loves pulling the strings! My mom had a bone marrow transplant when I was in elementary school, in the first year of her long, thirteen year battle with breast cancer. 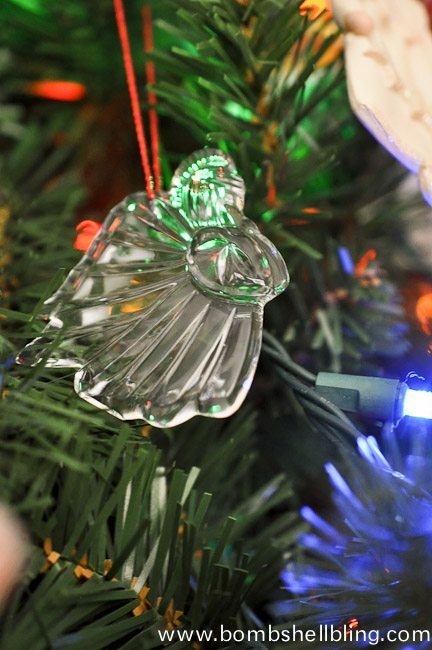 Things weren’t going well for her, and one of the nurses hung this glass angel on her IV stand to watch over her. She lived through several complications which should have logically killed her, so I do indeed believe that angels were watching over her and protecting her so that she could have enough years in this life to raise her three girls, and I love seeing this reminder of that. This is another little angel that my mom loved. I’m not sure where she got it, but each year she gave it a special spot. I wish I could remember why it was so special to her, but now I love to see it and smile when I do. This is an ornament that my mom bought in London. Every year my dad used to travel to London for business, so the year that I graduated from high school my mom and I tagged along with him and went sightseeing while he was at work. Once his meetings were over we all headed over to Paris for a few days. That trip is a very treasured memory that I now have. 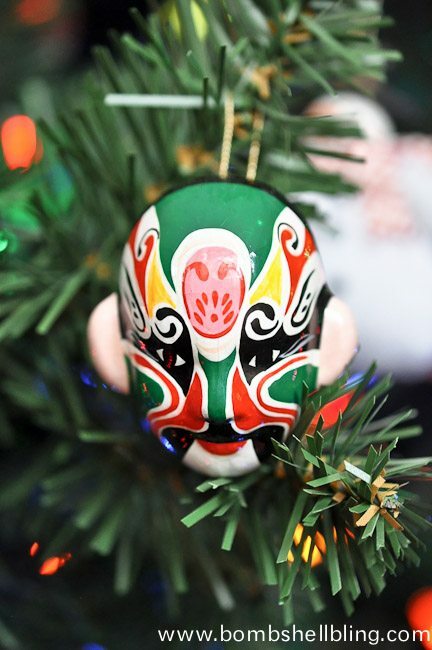 I got this ornament in China. I spent one semester in college living in far northwestern China as a volunteer English teacher. I actually couldn’t find any actual ornaments or a nativity there, but I bought this trinket and glued a ribbon onto the back. When I was in college my mom passed away after her long battle with breast cancer. We were showered with love and expressions of comfort, which an amazing blessing. However, we also just wanted to escape to process as a tiny little family of four, so a kind friend from church lent us his home in Martha’s Vineyard for a week. My dad, my sisters, and I spent a week there talking, relaxing, sightseeing, and beginning our very slow healing process in earnest. While we were there we bought this ornament to represent our missing angel, my mom. A year after my mom’s passing something big happened. I met my husband. My kind, sweet, humble, intelligent, driven, jolly husband. I hit the jackpot with that man!! We met when we were both spending the summer serving as performing missionaries for our church in Nauvoo, Illinois. I feel in love with his voice and then with him. We weren’t allowed to tell one another about our feelings or even touch offstage because we were following mission rules, but we both knew. EVERYONE knew. It was apparent. We were married a matter of months after we got home. Best decision that I have ever made in my entire life! After we had been married for a few years my husband’s parents spoiled us by taking the entire family to Europe for a couple of weeks. It was a whirlwind trip because we were bouncing from country to country, but we saw so many AMAZING things and places! 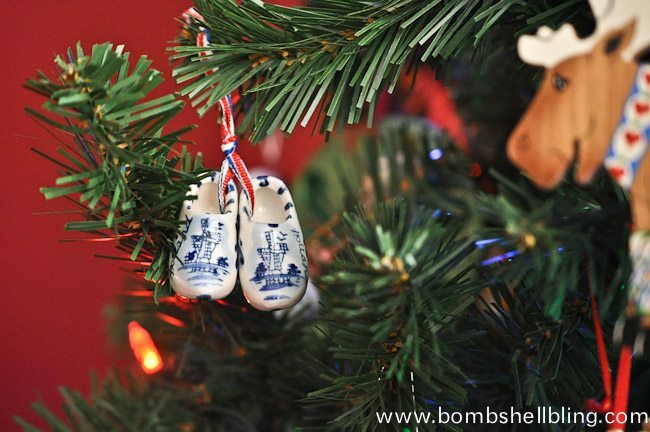 These are only two of the ornaments that I picked up during that time, to represent Holland and Denmark. 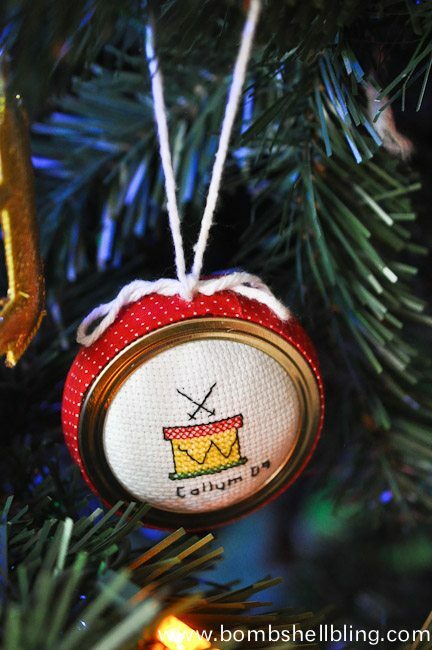 My husband’s aunt is amazing and cross-stiches every new addition to the extended family an ornament with the name on it, even the kids that are born to her nieces and nephews! What a treasure! 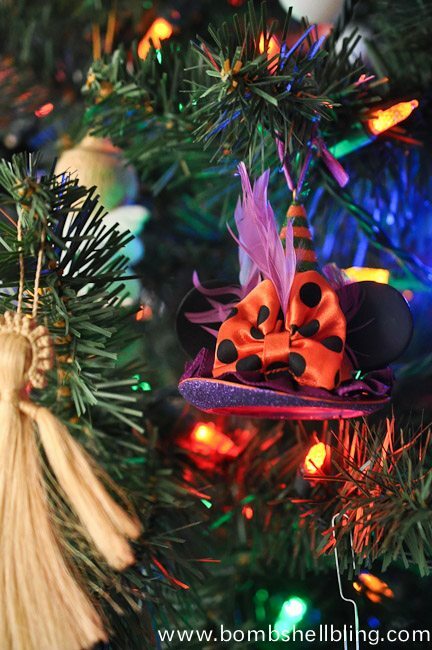 This ornament represents the AMAZING trip that our little family took to Disneyland one Halloween. It is the only non-extended-family trip that my husband and I have ever taken! We have obviously been many amazing places with our families, but we didn’t even splurge on a fab honeymoon, so this was super thrilling for us! 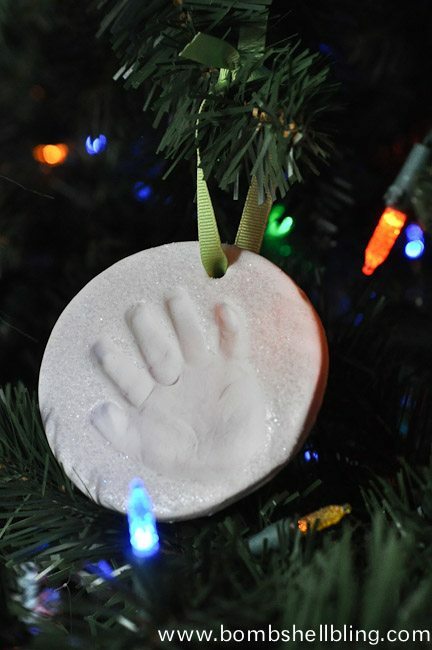 Of course, no family tree is complete without some sweet, kid-made and handprint ornaments! Sweetest. And that’s it. Thank you for indulging my trip down memory lane. 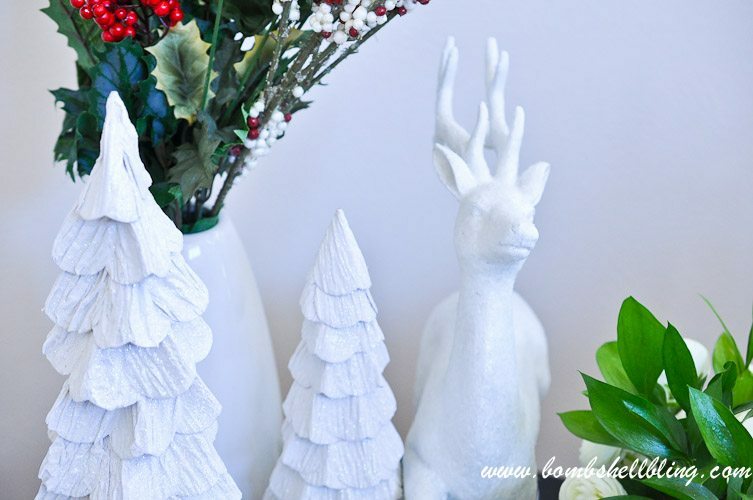 I have one more quick sewing tutorial for you tomorrow and then I think I will be signing off until next week so that I can spend concentrated time with my family, but I can’t wait to show you all that I have in store for this blog in the New Year! Merry Christmas, my friends. I am truly, truly grateful for your support! No, it doesn’t look like something in Pottery Barn, but it’s better. All of the little touches and stories behind them are more beautiful than anything in a catalog. This has to be one of my favorite posts you’ve done. 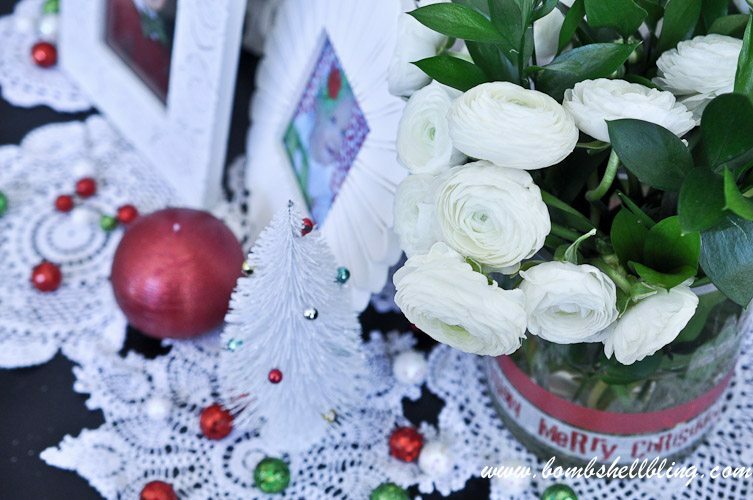 Thank you for sharing your home and Christmas memories with us. Big hugs, and a Merry Christmas to you sweet friend! Thank you so much, Ann Marie!!!!! This was so sweet, I almost cried. What an awesome collection of memories! I love all the stories behind everything. 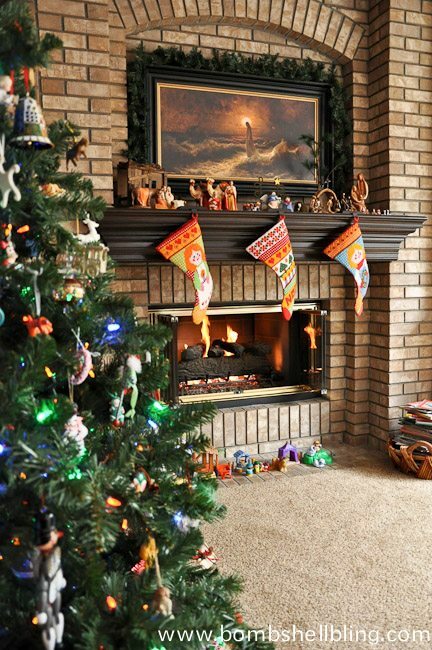 Your house is decorated beautifully!! Thank you, Crystal! I really appreciate all of your comments and support! I love it! My house is very similar to yours. 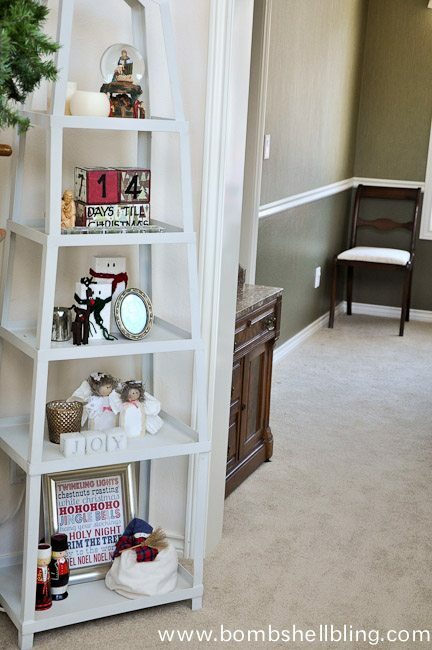 There are stories behind almost all of our decor. I collect Christmas trees. Something about them make me happy. And we have even more similarities than I thought. 🙂 I am Laura and I have a sister, Sarah. And your Grandma was Barbara and my mom was Barbara. 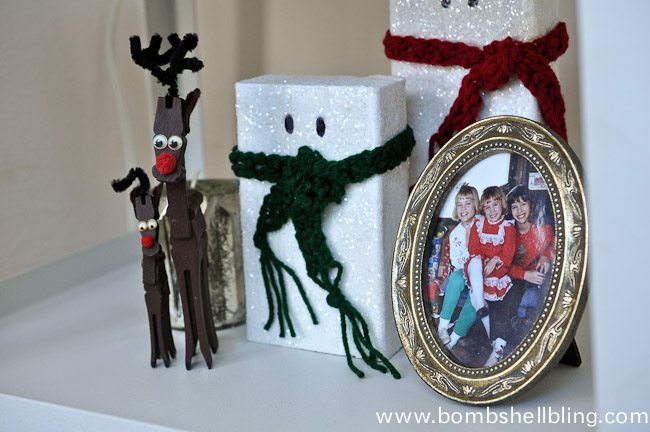 I love how you were able to incorporate your own stuff with your mom and grandma’s. I don’t have any Christmas stuff from my mom as she was a different religion and didn’t celebrate Christmas, but I do have her china we use every holiday. SOO many similarities! Thanks for sharing, Laura! I love that you use her China! My mom’s China is in the dining room but I’m afraid to use it because it might break! I am all teary eyed after reading this! What a sweet, sweet post. I love all of your decorations. Thank you so much, Carmen!! I think it does. 🙂 Thank you! !